Alignment and Corpora – To Align or Not to Align? Is it useful for a translator to use alignment tools? To create what? Corpora or TMs? Gloria Corpas Pastor, Miloš Jakubíček, Balazs Kis and Andrzej Zydroń; Moderator: Juliet Macan. Bio texts of the panellist will follow. The Singularity (as described by Ray Kurzweil, a well-known futurist) is the point in time when machines become more intelligent than humans in every respect. We don’t know whether this will ever happen. The panel will consist of people who do and people who don’t believe in the Singularity, all discussing the future of professional translators in a pre-Singularity world, that is, the world we live in. – The Singularity, if it happened, would change everything in unpredictable ways. Thus, the nature of a post-Singularity word is beyond the scope of the proposed panel. – The question for the panel (and audience) is whether (in our pre-Singularity world) raw, that is, unedited, machine translation (MT) will be able to handle all types of translation tasks. Right now, it is satisfactory for only a few types. 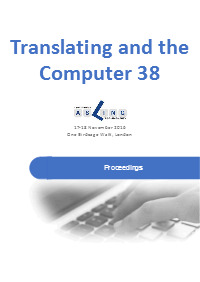 As it improves, what types of translation will still need professional human translators? – Several prominent members of the world of translation have agreed to participate on the panel. Alan Melby worked on a machine translation project for a decade before switching his focus to tools for human translators. He is a certified French-to-English translator, president of LTAC Global, a small non-profit, and a member of the governing council of the International Federation of Translators (commonly known as FIT). Joanna Drugan is the author of a well-known book on translation quality that was based on ten years of research, including interviews with many people in various corners of the translation industry. Joanna Drugan is Senior Lecturer in Applied Translation, School of Politics, Philosophy, Language and Communication Studies at the University of East Anglia. Mikel L. Forcada is professor of Computer Languages and Systems at the Universitat d’Alacant, president of the European Association for Machine Translation (EAMT), book review editor of the international journal Machine Translation, founder and president of the project management committee of the free/open-source machine translation platform Apertium, and co-founder and chief research officer of language technology company Prompsit Language Engineering. Dieter Rummel is head of the information technology unit in DGT (the Directorate General for Translation) of the European Commission, and as such is well known in the translation technology field. As co-founder of Symbian (1998), David Wood was one of the pioneers of the smartphone industry. As chair of London Futurists he has organised over 150 meetups since 2008 on topics such as the Singularity, transhumanism, technoprogressivism, and the abolition of aging. He is an independent futurist consultant, writer, and keynote speaker. Moderator, Olaf-Michael Stefanov, is Vice-President of AsLing, and has co-chaired many Translating and the Computer conferences. He worked for the United Nations for 36 years, in various information technology and language support positions.